By a numerical continuation method called a diagonal homotopy, one can compute the intersection of two irreducible positive dimensional solution sets of polynomial systems. 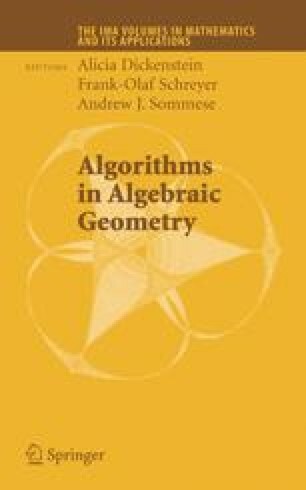 This paper proposes to use this diagonal homotopy as the key step in a procedure to intersect general solution sets that are not necessarily irreducible or even equidimensional. Of particular interest is the special case where one of the sets is defined by a single polynomial equation. This leads to an algorithm for finding a numerical representation of the solution set of a system of polynomial equations introducing the equations one by one. Preliminary computational experiments show this approach can exploit the special structure of a polynomial system, which improves the performance of the path following algorithms. This material is based upon work supported by the National Science Foundation under Grant No. 0105653 and Grant No. 0410047; the Duncan Chair of the University of Notre Dame; the Land Baden-Württemberg (RiP-program at Oberwolfach); and the Institute for Mathematics and Its Applications (IMA), Minneapolis. This material is based upon work supported by the National Science Foundation under Grant No. 0410047; General Motors Research and Development; the Land Baden-Württemberg (RiP-program at Oberwolfach); and the Institute for Mathematics and Its Applications (IMA), Minneapolis.